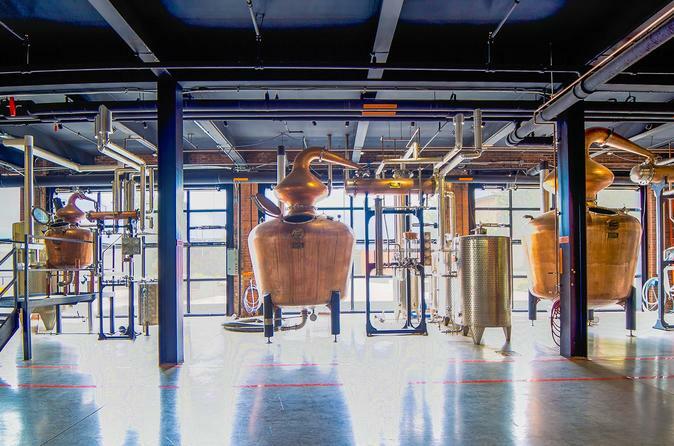 Copper & Kings is an American Brandy distillery located in the Butchertown neighborhood of Louisville, Kentucky. We have been awarded Best Distillery in Louisville three years in a row. Come see why! Visit www.copperandkings.com to view tour times, visitor center and gift shop hours. Tour times may be subject to change due to holidays or on-site events. CALL (502) 561-0267 or EMAIL our Tour Manager, Drew Pomeroy (drew@copperandkings.com), to confirm your reservation. The Copper & Kings tour experience is $15+tax and will take between 45 minutes to an hour. All guests will see our modern facility, our beautiful copper pot stills, and our barrel room. This tour will also include three tastings and a signature Copper & Kings glass to take home. We hope to see you soon! Visit our website for tour times, visitor center and gift shop information. Kentucky’s rich distilling heritage is now forging the future of craft spirits with innovation, creativity and personality. Copper & Kings is a brandy distillery based in Louisville, Kentucky that makes a dynamic, American style of brandy. Our brandies are batch distilled exclusively in copper pot-stills, and are non-chill filtered with NO added sugar, boise (oak infusion), synthetic chemicals or caramel coloring. Copper & Kings produces spirit with a natural flavor, nose and color. In addition to brandy, Copper & Kings also produces Gin, Absinthe and Orange Curacao from our grape and apple based brandy spirits. Learn about the history and the future of American Brandy and the role Copper & Kings has and will continue to play in that story.